The driver seat belt and, if the front passenger seat is occupied, the front passenger seat belt are not fastened. Fasten seat belts. There are objects on the front passenger seat. Remove objects from the front passenger seat and stow them safely. An acoustic signal will sound for a few seconds if the seat belts are not fastened as the car pulls off and reaches a speed of more than approximately 25 km/h (15 mph), or if the seat belts are unfastened while the vehicle is in motion. The warning lamp will also flash. When the ignition is switched on, the warning lamp will not go out until the driver and front passenger fasten their seat belts. After the ignition has been switched on, the belt status display in the instrument cluster display shows the driver whether the rear seat passengers have fastened their seat belts. 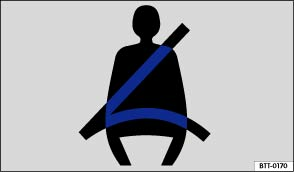 The symbol indicates that the passenger on this seat has fastened his or her seat belt. The belt status display will be shown for approximately 30 seconds if a seat belt is fastened or unfastened on the rear seats. The display can be hidden by pressing the button in the instrument cluster. If a seat belt for one of the rear seats is unfastened while the vehicle is in motion, the belt status display will flash for a maximum of 30 seconds. If the vehicle is travelling faster than approximately 25 km/h (15 mph) an acoustic signal will also sound. Incorrectly fastened or unfastened seat belts increase the risk of severe or fatal injuries. Seat belts only offer the optimum level of protection when they are used properly.